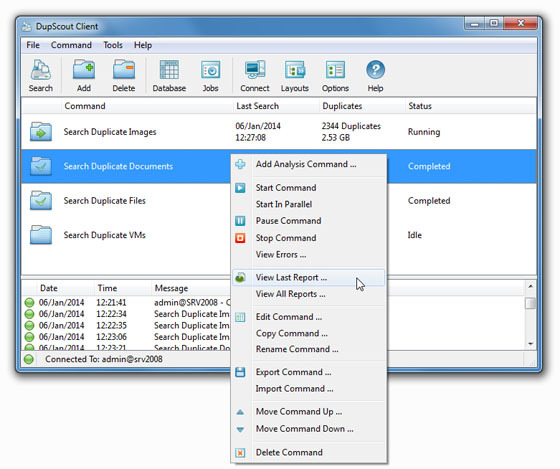 DupScout Server is a server-based duplicate files search and removal solution, which runs in the background as a service and provides a web-based GUI interface allowing one to connect to the server using a regular web browser, configure duplicate files search operations, review detected duplicate files, generate reports, remove duplicate files or schedule fully automatic, periodic duplicate files search and removal operations. DupScout Server allows one to configure an unlimited number of duplicate files search operations, with each one capable of detecting duplicate files in one or more disks, directories, network shares or NAS storage devices. The user is provided with the ability to review detected duplicate files, generate HTML, PDF, text, CSV, XML reports or export reports from multiple servers to a centralized SQL database for advanced trend analysis. Server Maintenance Portal (Popularity: ) : Manage your Windows NT/2000/XP/2003 environment from a dynamically built web portal. Server Maintenance Portal is WMI (Windows Management Instrumentation) compliant.